So, I started writing a post about “Avoiding Oriental Rug Overkill” (because there can be too much of a good thing). As I was doing my research, I found an AMAZING rug auction coming up on June 26 that I had to post about instead. We’ll talk about avoiding overkill next week. 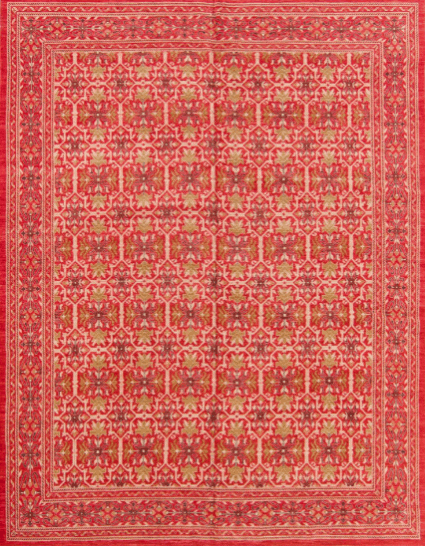 I LOVE Oriental rugs, and I’m working on a project right now that has an heirloom hand-made Oriental as its foundation. (Hence, my rug-on-the-brain.) 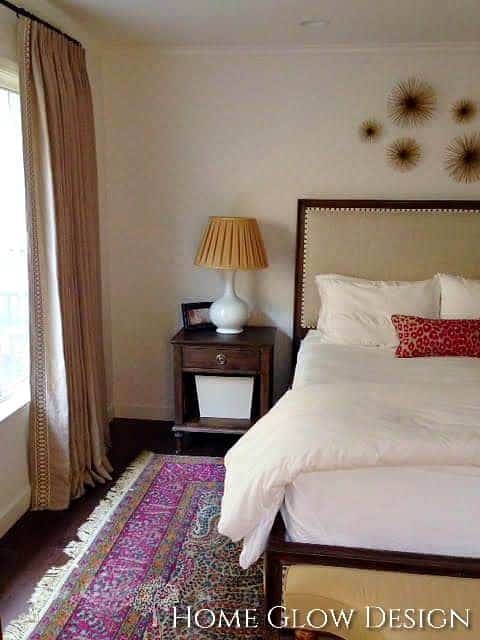 I have 3 hand-made vintage Orientals in my house, and I’ve used them in a number of client projects, including the below bedroom. There is absolutely nothing better for durability, stain resistance (and hiding), quality, and color variation. Each is a work of art. Moreover, because they are all hand-knotted, they can be FIXED if damaged. (That is one of the big drawbacks of hand-tufted rugs — you cannot fix them nor can you submerge wash them if something happens to them because of the backing that is applied). Gens X and Y, for the most part, don’t want them. Thanks to people like Emily Henderson, who likes to incorporate them into her Boho, mid-century designs, a certain geometric look is getting hot again. eBay and Etsy sellers know this and the prices have gone up, IMO. Far and away, the best place to buy an heirloom Oriental is at auction. Friggin’ Amazing Rug Auction — Don’t Be Scared! I don’t understand why people are comfortable buying things off of eBay, Etsy, and EBTH, but they are scared away from traditional auctions — many of which have online bidding, like the one I’m looking at today. There are some important things to know about — like opening bids, estimates, buyer’s premiums and shipping, all of which you can learn about here — but once you know the rules, off you go! The world is your oyster! 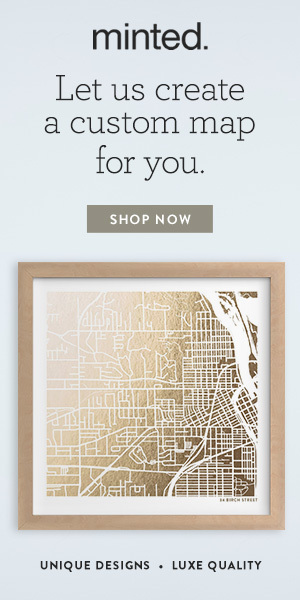 For example, a 10′ x 14′ version of this Pottery Barn tufted rug is $1,599. 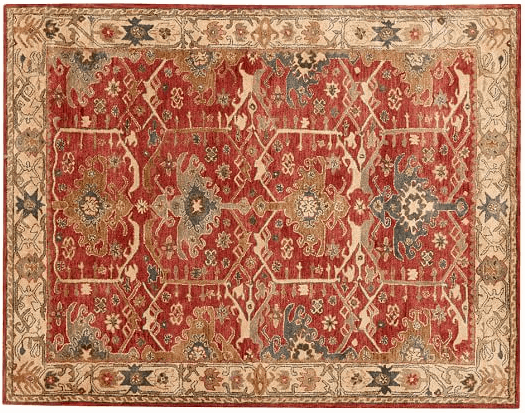 $1,500 is the top estimate of many of the heirloom rugs that I have below — those that are huge and gorgeous — and many are much lower. Some will be sold for over the estimate, many for under. It really all depends on who is watching the auction. Not all of these are vintage. One more great thing about this particular auction — the auction house has already included shipping estimates with each lot. That’s huge! It means you don’t have to call around getting shipping price quotes prior to bidding. Here are some of my favorites that are large and room-sized, but there are lots more in the sale. I have two groups for you — 1. traditional rugs, and 2. Moroccans and kilims. Knock yourself out! Because why buy Big Box when you can afford an heirloom? 1. / 2. / 3. / 4. / 5. / 6. / 7. / 8. / 9. / 10. / 11. / 12. / 13. / 14. / 15. / 16. / 17. / 18. Any favorites? It’s really hard for me to choose! I’ll be back in time next Saturday to discuss how to avoid going overboard with your Oriental rug obsession before the sale starts.